NERR has created a secure, climate controlled environment that protects your computer and tape media. The temperature and humidity in our vault is controlled by a separate heating and cooling unit. This vault has a fire rating of four hours and is monitored. We can set up tape rotations to keep your back up tapes off of your site in the event of a building catastrophe or a database crash. Storage and retrieval of files, CD’s, microfilm, microfiche, and assorted tapes: DLT, LTO, DAT/DDS, 4MM and 8MM. We use the O’Neil Software Inventory System that with barcodes: locates, tracks and organizes all of your media data. 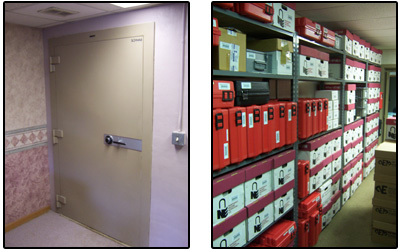 NERR offers for sale, various size hard cases to protect and transport your media data from place to place.